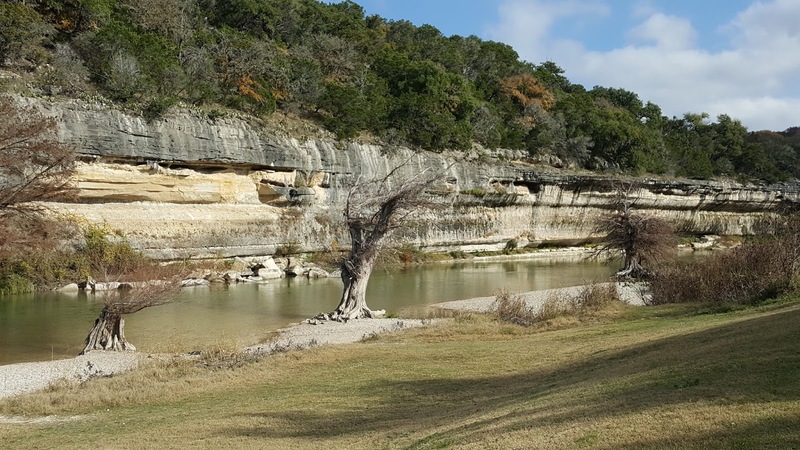 We so enjoyed Guadalupe River State Park. Nice walks by the river with clear water and old , very interesting bald cypress trees. With no dam on this section of the river, note is made in the park that flood waters can top the cliffs across the river. While at Guadalupe, the temperatures went down to 24 degrees at night. We saw these plants along the road and thought there was ice somehow on the plants. 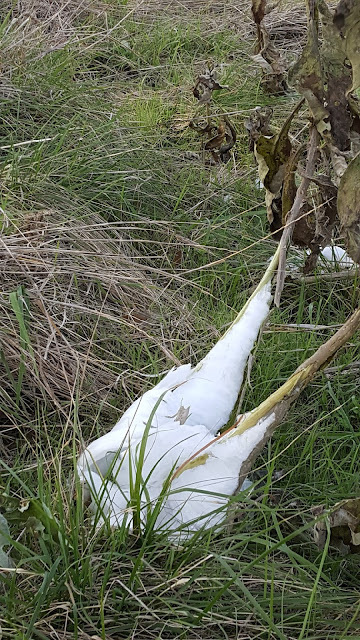 Turns out they are called freeze weed. Everyone there thought they were quite common. The rangers indicated that this is how they blossom. 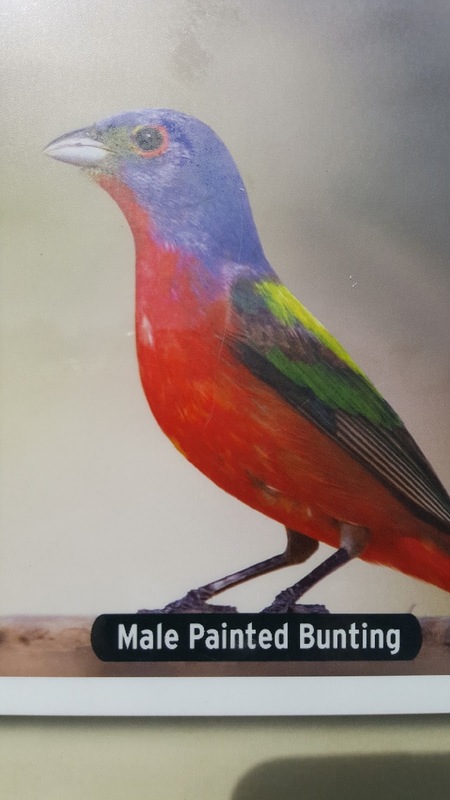 In the park, are pictures of the male painted bunting. A tropical bird with bright colors of blue, red, pink, purple, yellow, and green. Not here in December, but a popular bird watching bird during the summers. Jan and I have mentioned before that we seldom make reservations. 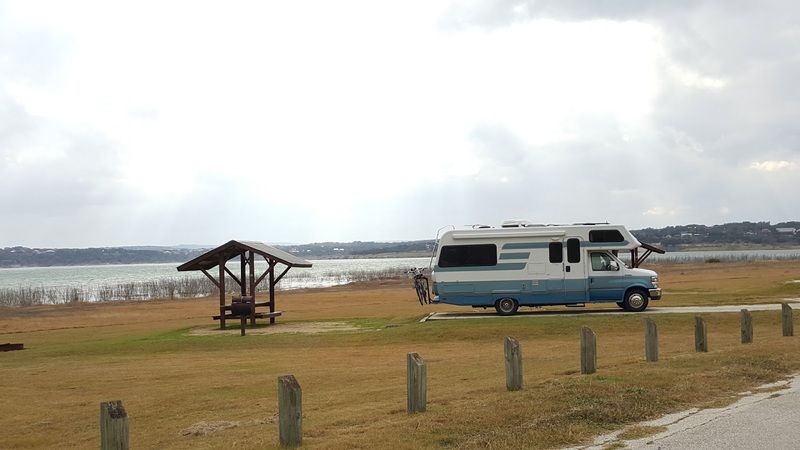 Well, we tried for this campground, Potters Creek COE in Canyon Lake, Texas. The first time , it was unavailable , closed for hunting. This time we find just one loop open. But great sites available with water views. We had been here two years ago, and the whole park was open. What we didn't realize was that there was a flood here on Memorial Day, 2015. Most of the park was under water. The picture above was the bathroom for our loop--up to the roof. 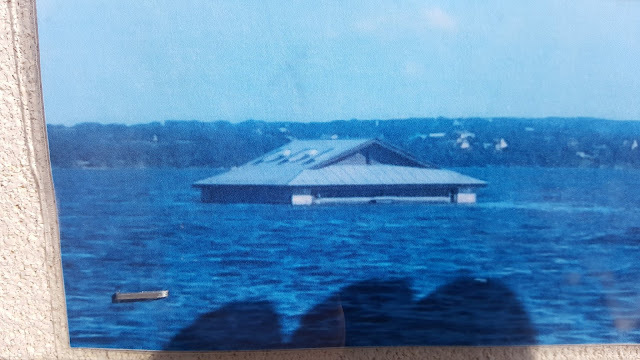 The first picture of Lady Blue, our current site, would have all of Lady Blue under water!!! They are a long ways from repairing the entire campground--a lack of funds, we are told. From our window, we are entertained by the large flock of coots. 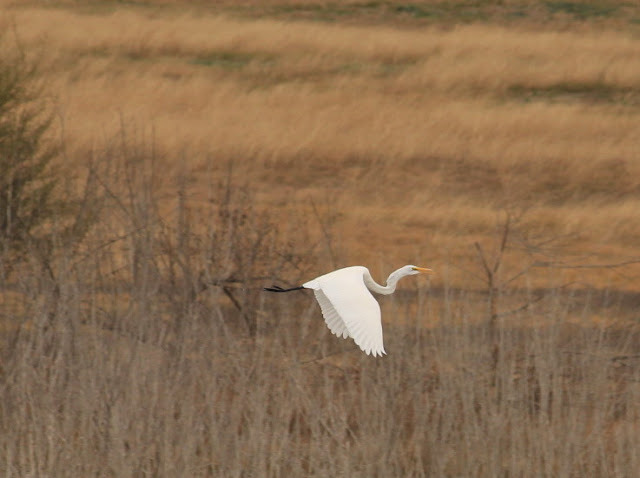 Also, every day, we can track the wandering of the white heron. He usually stays close to the coots. The coots never stop moving. The splashing is from the diving for food. Right in back of Lady Blue is our picnic table with a shelter attached. 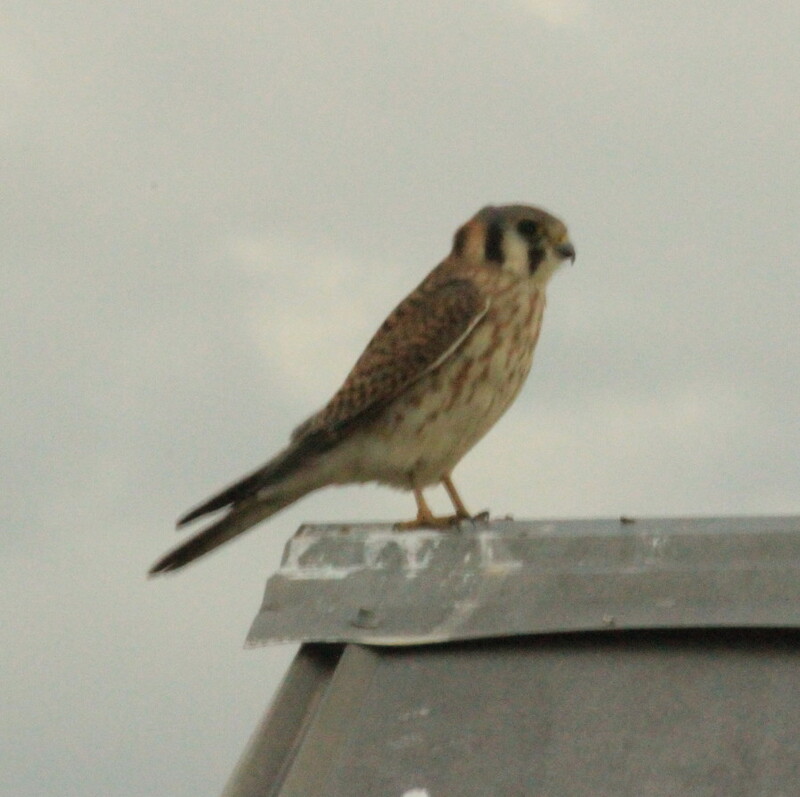 This kestrel enjoyed the roofline, several times a day, to hunt for insects and small food. Note his head turns completely around while he looks along the grass for food. 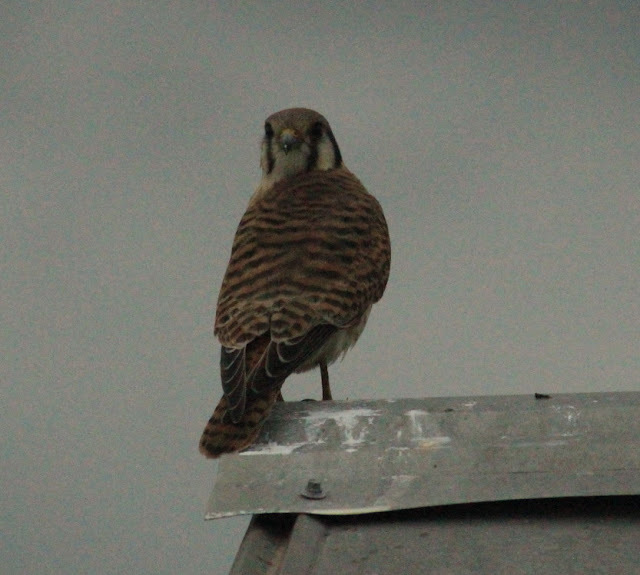 A small bird, about the size of a bluejay. But, a real powerful, sharp beak .